Glossopharyngeal neuralgia involves severe pain generated by pressure from a tumor, an artery, a vascular malformation or unknown causes on the ninth cranial nerve. Symptoms include a severe, lancing series of electrical-like stabs near the tonsils or the back of the tongue on one side. The pain may also radiate to or originate in the ear. Swallowing triggers the pain. During severe attacks the patient may sit motionless, head flexed forward, allowing saliva to freely drool from the mouth. Cardiac arrest, syncope (fainting) and seizures have been associated with attacks of glossopharyngeal neuralgia. 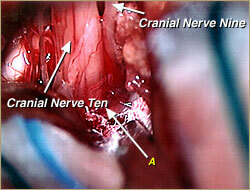 Except for the location of the pain and the stimulus for the pain, the attacks are identical to trigeminal neuralgia . Pain may be reduced by injection of cocaine into certain skull structures. Medical therapy with phenytoin or carbamazepine gives some patients short-term pain relief. Usually, the persistence and severity of pain requires surgery to cut some of the nerve fibers. In some cases, microvascular surgery can move the blood vessel causing pressure away from the nerve. Although there are some operative risks, the results of sectioning the ninth cranial nerve are uniformly excellent for total pain relief from glossopharyngeal neuralgia.